ORISHA International has generously offered one of its exquisite performances to Project SafeCom as a fundraiser during this year's annual tour of West Australian schools and communities. In turn, the KULCHA Multicultural Arts Centre in Fremantle has offered to host this performance, while Mr Suresh Rajan, President of the Ethnic Communities Council of Western Australia and Multicultural Arts of WA is confirmed to deliver the opening address. This event is a timely reminder that the notion of multiculturalism and cultural diversity, especially after the recent bombings in London, needs our personal and ongoing affirmation, endorsement and celebration. Already some writings, even from academics such as Macquarie University's Professor Drew Fraser have appeared calling for an end to this essential Australian set of values and for a ban on Asian and African immigration and a withdrawal from the UN Refugee Convention. Awakening of the Myth will be a celebration of culture, myth and folklore of Balinese and Indonesian culture, and the skills of Orisha's Rina Zani and Omar Pumar Romay will be a tantalising invitation to your active participation as an audience. And with Indonesian catering provided by Bunga Raja, you're likely to leave with a clear vision of the richess we have as Australians in our diverse cultural context. ORISHA International, an independent Australian performing arts company, tours WA schools and communities every year during August/September. This year's tour of WA will include extra performances in a special collaboration with Project SafeCom (WA), to be presented at Kulcha Multicultural Arts WA in Fremantle. 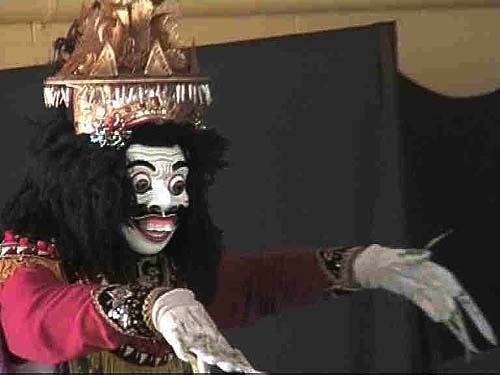 Awakening of the Myth Indonesian Topeng (mask) dance and contemporary hybrid theatre in cabaret-style. Quirky, weird, perverse, sad and funny, expressive masked characters and supple dancers highlight the almost forgotten rituals and ceremonies of ancient living spirits. Daring social (mis)adventures promise an evening of unforgettable cultural (con)fusions, fun and laughter. All proceeds support WA's Project SafeCom's significant human rights and social justice advocacy and community cultural development works. The Dance of Jauk based on traditional Balinese Topeng performance style will be creatively facilitated to encourage audience's courageous inputs to plots and characters. Jauk, a mythical forest spirit, is threatened with extinction by savage capitalism. 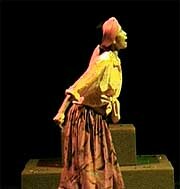 Dewi a mute village girl wanders the streets in an attempt to revive the human spirit and imagination. Will someone (anyone) understand her desperate gestures and moans? The Dance of Jauk thoroughly engages the audience in interactions and improvisations towards collective resolution. ORISHA International performances and presentations are funny, perverse, sweet, quirky, exotic, confronting, politically correct/incorrect and weird. 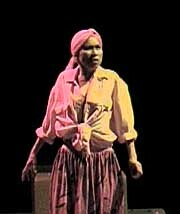 Always inspiring and daring the audience to engage, performances and presentations are unpretentious cultural diversity collaboratively designed by ORISHA's principal culturally-diverse Australian artists - Theatre Director Omar Pumar Romay and Performer/Choreographer/Writer Rina Sani, whose multicultural works have toured extensively throughout Australia and overseas.